We’ve learned from people who succeed in art and entertainment that a “never say die” attitude is essential. Rittz is a prime example of this. His album The Life And Times of Jonny Valiant has exceeded expectations and has made him one of the hottest up and coming rappers in the game. Look inside the album and you’ll see a drawing from another prime example of someone who’s never wavered from his dreams: artist Davis Graham. The 18-year-old artist from Chilliwack, British Columbia, has been drawing nearly his whole life and the dedication has paid off. Little did he know when he drew a portrait of Rittz that he would eventually be asked to do another drawing for the Gwinnett County’s debut album, spreading his artwork across the entire world. We tracked down Davis to hear his story, one that every aspiring artist should pay attention to. When and how did you first get into drawing? I guess when anybody starts is elementary school with assignments and stuff. I’d be the one that was walking around and helping everybody with their drawings. My first ever portrait was a drawing of my friend Caleb and I was seven years old and my mom knew who it was and stuff and she couldn’t believe I drew it. So when you hear that kind of praise at seven years old you’re just going to stick to it so I just kept drawing portraits all the time and now here I am 11 years later, still doing portraits, but now it’s paying off. So when you look at that first portrait, how does it look to you now? (Laughs) It’s brutal but it still looks like him. I can see why my mom would be shocked. It doesn’t look like a seven year old drew it, that’s for sure. Did you ever have any formal training or was this just all you growing up and learning it on your own? Yeah this is just me on my own. I just hung out outside and drew a lot. That’s just my one hobby that I have. So, no training. On your Facebook you have a lot of your drawings are that of emcees and other hip hop figures. I would assume you like the music very much. What draws you to hip hop so much? What draws me to the music is just the realness of people expressing themselves and being honest. Through all other music there’s that, but in hip hop people are really raw and don’t hold back and that’s why when I draw somebody it’s somebody that I idolize. I just idolize a lot of hip hop emcees because they speak the truth and it touches my soul so that’s why I draw them. Do you have any favorite emcees that you could list off? Yeah I could easily do that: R.A. 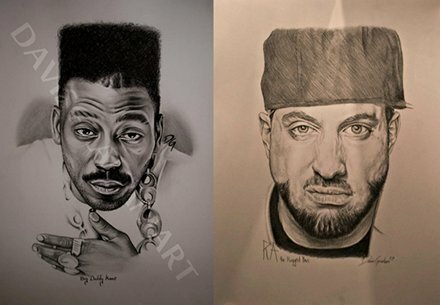 The Rugged Man, Rittz of course and Big Daddy Kane. I’ll do one more…let’s see…I just love all of Wu-Tang Clan so I can’t pick just one of them. That’s quite the list you have, from old school to new school. What do you like about Rittz specifically as an artist and emcee? The first time I heard Rittz I heard “Sleep At Night”. I heard that song and I’d seen pictures of Rittz and I just never looked into him because I’d just browse past him. I just remember seeing him with a picture of R.A. The Rugged Man and then I was like “Alright I’m going to give him a shot” and then I heard that song. First and foremost, his voice and his delivery was like the best. Then I got his mixtape and I listened to it and just the fact that he’s like, he’s just so honest and it’s the same way that I respect any other emcee, just being honest and not holding back and just the fact that i Just love, there’s nothing more that I love than blasting his music. I learned all the words and rap on time with him and he’s the most fun to rap on time with because he’s just so quick. I just love how real he is and he doesn’t ever try to be something that he’s not by any means. 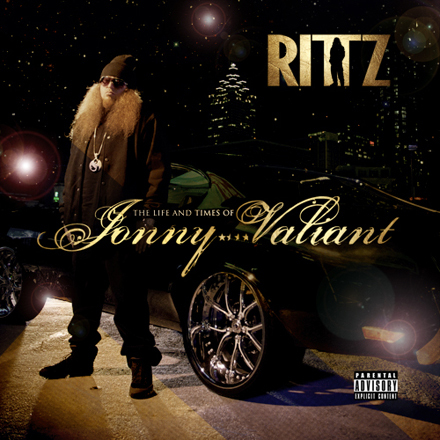 How did you get this opportunity to have your drawing in the Rittz Album? Oh I listened to his music for the first time and was like “I’m going to draw him.” I posted on Twitter “Just listened to @therealRITTZ for the first time, I’m going to draw him tonight” and he re-tweeted me and then responded right away with like “Looking forward to it!” I was like “Clearly I picked the right guy to draw!” He pays attention to his fans which is another reason why I love Rittz. He cares about people that are making him who he is. So I drew him and put him up and I put the drawing up and then that night he shared it and got me like thousands and thousands of likes on my page. He got so much attention on my page. Ninety percent of the fans on my page are Rittz fans. Then he tweeted me asking for my e-mail and then right away he asked me if I could do work for his album. Then he sent me pictures and I drew it up and we kept that secret until he published it in his album. I just did it for free and all of the sudden I got a check in the mail from him and I didn’t ask for anything in return so that was really nice. I didn’t ask for anything because I thought “I’m getting my work in Strange Music.” That’s all I needed but he still sought to send me some money so I thought that was really nice of him. How does it feel to have the opportunity to have a piece of your artwork spread all over the world through this album? I never even thought about it that way. I never even considered it being in everybody’s hands because yeah that’s pretty amazing. I just love working with somebody that I admire, like getting my artwork on a real musician’s album. I choose to put my artwork on the inside of his album before Lil Wayne or anybody like that. That’s not what I care about. I just want to collab with people that I admire and actually listen to on the daily. More than anything you do it because you love it and you respect his music, that’s awesome. Other than that though obviously it’s had to do good things for your exposure. How has it affected your exposure and your reach as an artist? Besides the fact that a hundred up and coming rappers message me once a week asking me to do mixtape covers and stuff like that. That’s helped a lot. I think it’s added to my portfolio. I can say if I want to get a job with another rapper I can be like “Well I did Rittz’s” and it’s just really helpful having that under my belt. A lot of people can take me seriously if they don’t already by looking at my artwork, and I just want everyone to know that I’m really open to stretching my abilities and trying new things all the time. I’m not strictly pencil artist. I’m doing graphic designs and stuff like that too. It’s just really helpful. What did you think of the album? It’s unreal, of course! I loved it. I think my favorite track is, I love the “My Interview” song, I live for it. I love the “Intro” too. I love all his music, I can’t even pick a favorite. White Jesus is a classic but I love it, it’s a great album. My last question, what do you want to do ultimately with your talent? What are your dreams and goals with it? Well I started a company called P.A.R.K., which is the Public Affiliation of Reckless Kids, and we’re a corporation that’s trying to counter against corporate greed and we’re trying to make every other corporation look bad. We’re pretty strong in my city right now and we’re hoping to move to Brazil and New York, but that’s my dream right now to express myself through my company so that people can wear the lifestyle on their shirt and represent what it means and what it means is to be reckless and follow your dreams and not end up at a desk job that you don’t want. We sponsor kids who are following their dreams so we can give them exposure and a reason to do what they’re doing. What I want to do is, you know, what I’m doing now is collabing with artists that I like and appreciate with similar mindsets. Strange Music, that’s why I was so excited to work with Strange Music because it’s the same deal. You guys just follow your dreams and that’s what I want to do. I want to hopefully become successful enough to live on my own with my company and my artwork and music also. 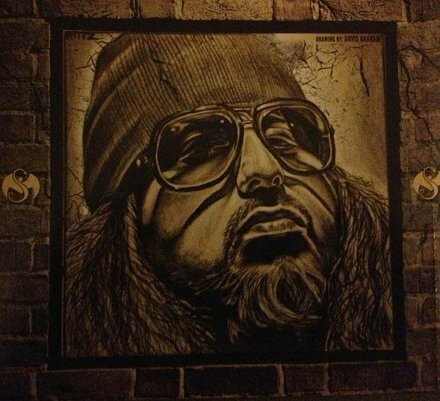 What do you think of Davis’ art and the drawing he did for Rittz’s album?